Google ad for SBCC, as we start integrating into IDEA Cafe "new" Method for Spiritual Startup and Growth +AGDM+ . Spending $4 per day, $120 per month, but ad can change and we can stop early if it's just not working. 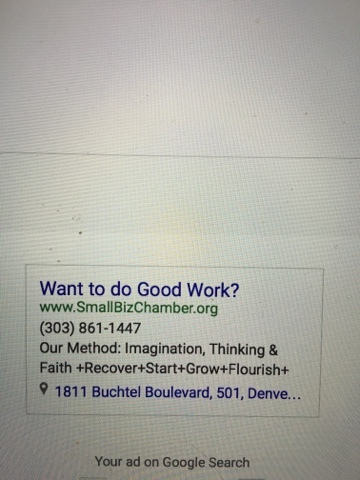 Small Business Chamber of Commerce, Inc. +Recover+Start+Grow+Flourish+ : Do Good Work? Want to? 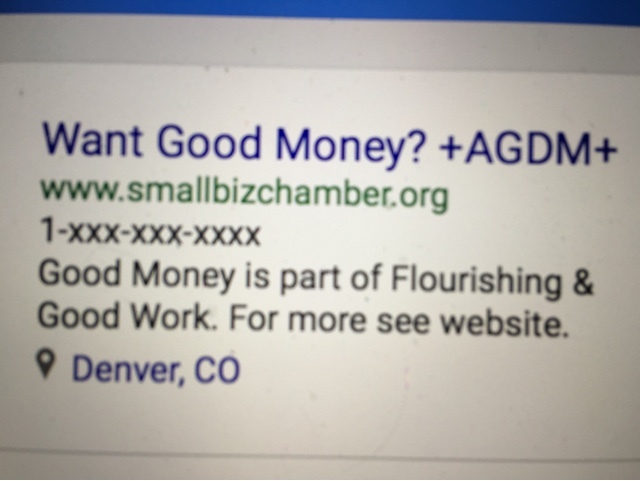 Small Business Chamber of Commerce, Inc. +Recover+Start+Grow+Flourish+ : Do Good Work? Want to? : Free meetings now, Christmas, January, check them out, click on above link. Join us as we share experience and ideas about recovery, faith, business startup and growth this Friday for our Denver IDEA Cafe Startup Workshop.